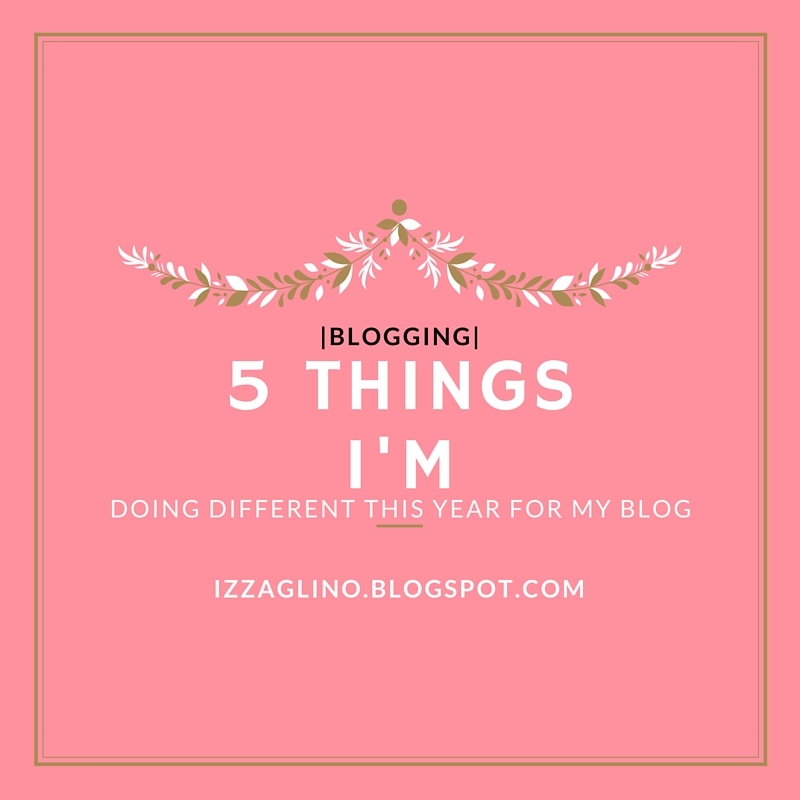 2016 marks my fourth year of actively blogging here in IzzaGlino. It's safe to say that I've managed to treat this blog as part of my life. Creating a blog, and maintaining it no matter what, is a decision I will always be grateful no matter what. IzzaGlino have changed through time. From its design to content, my vision and mission to this blog have been altered year after year. 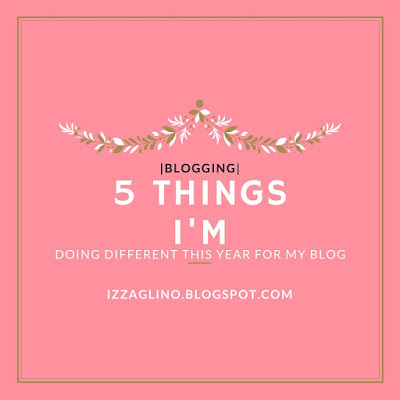 Today I'll be sharing the 5 Things I'm Doing Different for IzzaGlino. Hope you find this post interesting. I've never set some goals for my blog. I guess for so long I've seen blog as "just another hobby." But last year I had the opportunity to attend a lot of blogging-related events that gave me so much inspiration and realization. I wanted to pursue blogging even better this 2016. And it all starts with setting some goals. If you want a glance of my Blogging Goals 2016 then click HERE. And by advance I mean one month advance. I already planned all the posts that will be up on IzzaGlino for January. And every now and then I add what posts will be published on February. The whole forward planning thing is making me giggle because it's one sign that I'm really committed in getting serious with my blog. Another great thing in planning posts in advance is that I take product shots in batch also. So all I need is a day to draft the post in Blogger and schedule them. I might share my blogging process soon so no worries. For the past three years my blog has been so all over the place. I will do a product review, a product hype and an amazing find where all posts look exactly the same. So over the holidays I made some more planning and organization on what topics I'll be covering over this blog. We'll have Beauty Topic that includes product reviews, hauls, something new in the market, empties, skincare routines, Pinay's Guide etc. Blog and Bullet Journal will be under the Tips Topic. Posts about blogging and how to start a bullet journal will be tagged in TIPS. This post you are reading is part of the TIPS. Books will be permanent in this blog and I am excited to share more book reviews, book hauls and more. Personal stories and events I've attended also have a home in this blog. You can easily spot the personal posts because they include keywords such as me, myself and I. Finally I'll commit to travel this year so expect some Travel Diary posts again. You can read my Tagayatay 2D+1N Travel Diary for some reference. Lifestyle posts will be divided into three categories namely Fashion, Fitness and Food. I'll share my fashion inspirations or my Outfit of the Week. I will also share some stories and food blog whenever I visit a great restaurant. Lastly, I will share some of my fitness updates just like the jogging after work that Nica and I are planning this week. Life Lately is a new addition to this blog and will be posted every Saturday. It's a mixture of a weekly review and things that I've been loving or worthy to share. The Sunday Post is meant for some devotionals, prayers and other posts related to faith. Last year I tried squeezing all the content writing on Friday night until Saturday morning. And it has been a torture to be honest. I get too little sleep on my day off that is doesn't prepare me for the following work week. So after some Pinterest searching I found a weekly writing plan that will suit me. More of this in a future post. That's the reason why this blog is busy this week because fortunately the weekly writing plan is doing great. It's always nice to release what's on my mind and publicly share it. Isn't that the whole point of blogging? It's your own opinion, your own story and you get to broadcast it on a big audience. Before 2015 ended I realized that this blog ought to have a personality. A personality that will set it apart from other beauty and lifestyle blogs. So this year my point of view in every post is like a diary type. I am letting all the words flow freely. I hope so far you are enjoying IzzaGlino. If you have any suggestion on how to make this blog better or if you have suggestion on what I should blog next then please feel free to comment below. IzzaShares: What's In My Bag? !